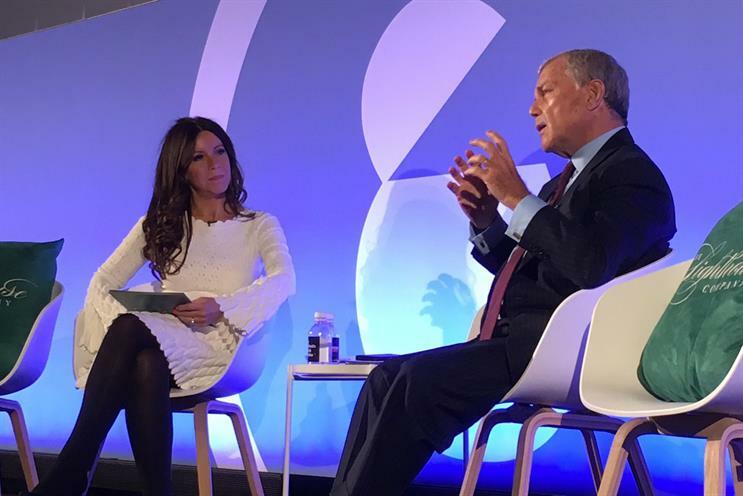 Sir Martin Sorrell used his appearance at Advertising Week Europe on Tuesday afternoon to pitch his new company’s mission as a return to the days before media people split from creative agencies. "We’re going back to the 1990s," Sorrell told his interviewer, Kathleen Saxton, founder of The Lighthouse Company. "But instead of separating media [from creative], what we’re doing is reuniting digital creative with media." This feeds into what some clients want, the S4 Capital executive chairman claimed. "If you asked me what is the thing in the last six months that I’ve heard from clients most, it’s lack of speed. They all say their organisations are too slow. That need for speed is absolutely critical," Sorrell said. "Gone are the days when you could call the agency and say ‘Can we have a meeting next week and then you go to the meeting and ask to develop a creative brief?'. And then after two weeks, the agency comes back and says the brief isn’t right or the creative department can’t handle it. It doesn’t work any more." He continued: "S4 Capital’s model is first-party data driving digital content and driving the delivery of that through programmatic. It’s a loop. "What you have to have is a continuous, iterative process. It’s like running a political campaign, but with no election date. It’s an iterative process where you develop content, you test it, you send it out, you test it, you get the results and you develop the content further. Sorrell claimed that the financial results released by S4 yesterday were evidence that the approach is paying off. He explained: "We are getting tremendous inbound interest [in the area] between content and media. In our results yesterday, we gave some concrete examples – Ikea, Starbucks – of where we produced assets at scale, at very low cost per asset, distributed them extremely effectively and gone through that loop process. The holy trinity as we call it, maybe ill-advisedly, of data, content and media, is absolutely critical. "There are several clients that we’ve seen who have taken that 'holy trinity' model and are embedding it in their organisation. They’re starting with the first-party data that they have and they’re deploying it to content and they’re deploying it to media." Sorrell was clear that S4 would stick to digital services and not "monkey around" with traditional media and that he would not countenance using earn-outs to build S4’s scale. "I had a conversation with some people last night and I asked, before we go any further, if you want to sell your business, I’m not interested," he said. "It’s not easy to create a unitary brand, but I think it is really important. The six holding companies, and indeed Accenture and Deloitte, are running into the same trap, and that is you think you can buy a whole series of small businesses and keep them separate. You can’t do that. It just doesn’t work effectively. "The earn-out structure is a very good structure, don’t get me wrong – if you implement it effectively, if you work on the conflict of people and clients, and bring the acquisition into the structure it’s attached to. But human nature being what it is, they don’t."